American Realty announces that Caribbean Living, the 2500 unit master planned development in Playa del Carmen, Mexico has put up record sales numbers again for the second year in a row. This company has won Builder of the Year awards nationally 6 of the last 7 years, which means that quality is first and foremost in everything they do. Caribbean Living, the 2500+ unit in Playa del Carmen, Mexico has put up record sales numbers again for the second year in a row. This revolutionary new condo and town home master planned development features American standards in construction quality, parks, gated communities and multiple pool and barbeque areas for each part of the community. Americans and Canadians will be familiar with many of the nearby amenities such as Starbucks, Pier 1 Imports, Sears, Walmart, Sam’s Club, and a movie theater that plays new releases in English. In addition, the development is less than 10 minutes from some of the most beautiful beaches in the world and 15 min from the bustling tourist area on 5th Ave. Considered the new ‘suburban area’ of Playa del Carmen, Caribbean Living blends the best of both the nearby attractions and the allure of affordable housing. Located in the suburbs of Playa del Carmen, Mexico, this is a mixed use project that combines condos and town homes, with prices from $59,000 USD for a two-bedroom condo in one of the most exclusive zip codes in the entire Caribbean. As the numbers above show, in calendar year 2013 approximately 600 units were sold, making this one of, if not the most, successful project in the entire Caribbean. 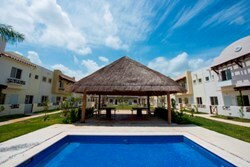 American Realty in Playa del Carmen is the broker for the project. “We are working with the most reputable developer in the entire country,” says Steve Didier, Chief Marketing Officer for American Realty. “A company that has won Builder of the Year awards nationally 6 of the last 7 years, which means that quality is first and foremost in everything they do." For more information, please visit http://www.American-Development.com.